As many uni students will agree (especially those who love a good cliche instagram), finding the best cafe in your city that serves great food and great coffee is a must. What seemed apparent to myself and my housemate Katie was that any good coffee shop we found also served pancakes. As we started trying different cafes across York, it seemed more a venture to find the best pancakes than anything else. Finally, after trying many different pancake options we've found our favourite pancake stop in York. Spring Espresso was one we heard about through the grapevine and we are so happy we found it. We did turn up to find it was full but, after a quick look in a few nearby shops and returning in hope for a seat, we managed to grab a table. One of the first things we noticed was the music. We're both Fleetwood Mac fans so hearing their album being played impressed us both. I decided to go for a latte and Katie went for a hot chocolate and they were both great. We enjoyed these while listening to the Fleetwood Mac as well as the usual contemplation of dropping out of uni at the shear thought of exams next term. While there was a wait before the pancakes came, they arrived at the right moment before we both had a meltdown thinking of the mound of work that was waiting for us both at home. When they did arrive, we could tell they were going to be good. I went for Banana, chocolate chip, Nutella and honey pancakes while Katie went for bacon and blueberry. I absolutely loved mine as they had banana running all through the pancakes and they definitely didn't stinge on the Nutella and honey. Katie also said she loved hers especially the crispy bacon which, compared to the other places we'd tried, was the best. It took us a while to get through the stack but there was no doubt we would both be finishing the whole plate. 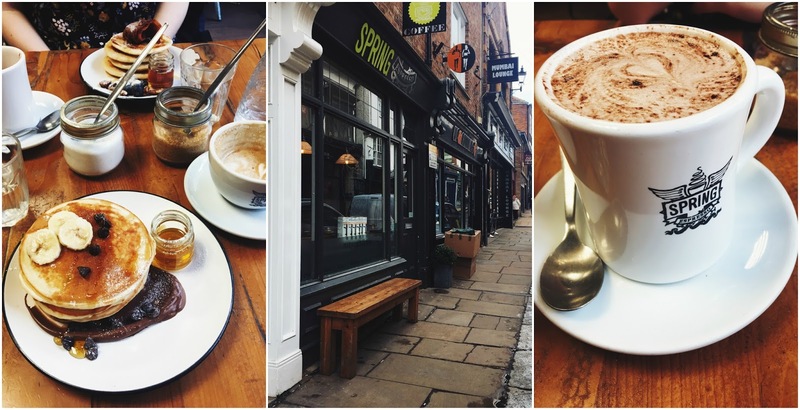 If you're in York, Spring Espresso has two cafes you can try if you're on the hunt for a pancake stop. I know me and Katie will be heading back next term and might even try something else. Let me know if you'd like to see some more York related posts soon!